What I like about this recipe is that everything is cooked in one pot, making clean up a breeze. However, when rice is involved, it could get a little tricky. 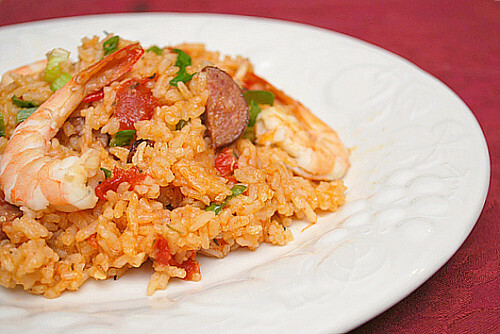 There are some rice dishes have a tendency to get gummy when overcooked or gritty when undercooked. And when it comes to jambalaya, when I've made it in the past on the stovetop, there's that potential for the bottom to get all burnt and crusty. For this recipe, the dish is pressure cooked and it ensures the rice won't scorch on the bottom. Also, if you can't find andouille sausage, you can substitute it with a beef sausage and add extra cajun seasoning to taste for that extra kick of flavor. Press SAUTE and add oil. When hot, add sausage, onions, garlic, bell pepper and celery; cooking until softened. When the display reflects L:15 (which is 15 minutes since the IP has beeped), turn the setting on top of your IP to VENTING. Doing so allows the IP to quickly release any remaining pressure (also known as QPR or QR). I use a wooden spoon to carefully turn the setting to avoid close contact with the potential steam. You may also want to turn your IP away from cabinets to allow the released steam to escape freely. The pin at the top of your IP will drop when all pressure has been released and it's safe to open. Remove the bay leaf and fold in the scallions while fluffing up the rice. Serve immediately.